We are a one stop shop for powder coating your wheels. Espo’s has been powder coating wheels in Staten Island, NY since 2007. Whether you are looking to black out your factory wheels, or looking to powder coat your aftermarket show stoppers, Espo’s has the experience and proper knowledge to provide the ultimate finish. In order to powder coat your wheels, they must be taken off of the vehicle. This allows a smooth, even finish to coat the entire wheel surface. This will ensure the complete application of the color and prevent future corrosion. In order to begin powder coating, Tires must be separated from your wheels. Although this may sound simple, extreme care must be used when removing the tires from your wheels. Here at Espo’s we have the equipment to properly separate tires from your wheels to guarantee that your wheel remains undamaged. Regardless of the current condition of your wheels’ finish, it will need to be stripped down to bare metal to ensure proper powder coating adhesion. Your wheels will be cleaned of road grime and brake dust and stripped of any paint or coating, and then sand blasted to create what we have found to be the idea profile for powder coating. Once the wheels are prepared for applying powder, they are electrically grounded and the powder is electrostatically charged. The charged powder is then suspended on the wheel until curing. After application, the wheel is then moved into an oven and cured at 400 degrees for a specific time according to the wheel’s mass and specific powder material requirements. This is the part that many inexperienced tire shops get wrong. 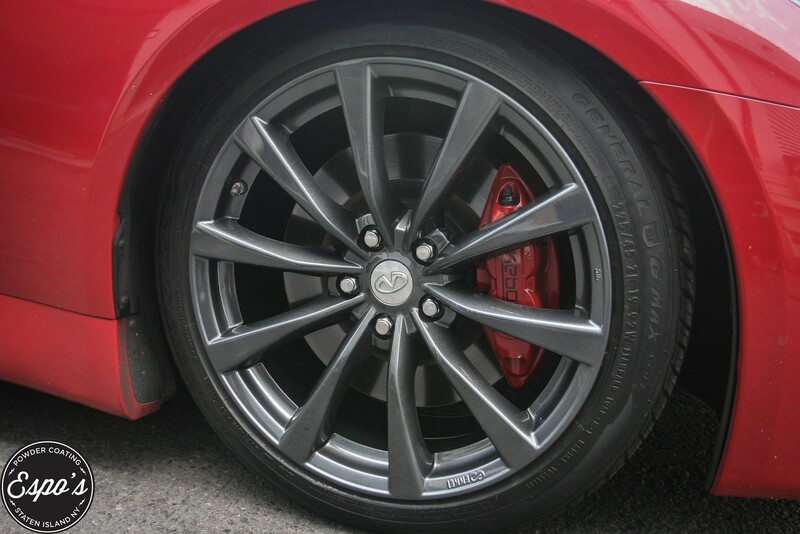 More than just equipment, we have the knowledge and technique to guarantee that the tire will be mounted without any damage to your wheels and rotating in the correct direction. We balance each tire using black or silver weights and place them in the most aesthetically pleasing location inside the wheel to ensure a smooth ride.